“Working in protest” is an intently rich premise, as it encapsulates different type of American demonstrations, including the Black Panther Party, Confederate Flags, the Iraq War, Occupy Wall Street and of course, Donald J. Trump. By skipping around the years, not only do Galinsky and Hawley expose how “everything old is new again,” but by showing a protest in real time purpose and opinion, it shreds the often skewered media packaging of these gatherings. HollywoodChicago.com first encountered Michael Galinsky for his film, “All the Rage (Saved By Sarno).” For more information regarding “Working in protest” at the 25th CUFF click here. The 25th CUFF has occupied the Logan Square neighborhood in Chicago – all films have screened at the centerpiece Logan Theatre – since June 6th, 2018, with its eclectic line up of offbeat and under-the-radar film fare. The final day on June 10th will also feature the Closing Night Film by filmmaker Lori Felker, “FUTURE LANGUAGE: The Dimensions of VON LMO,” with the awards and afterparty to follow (click the link below for more details). 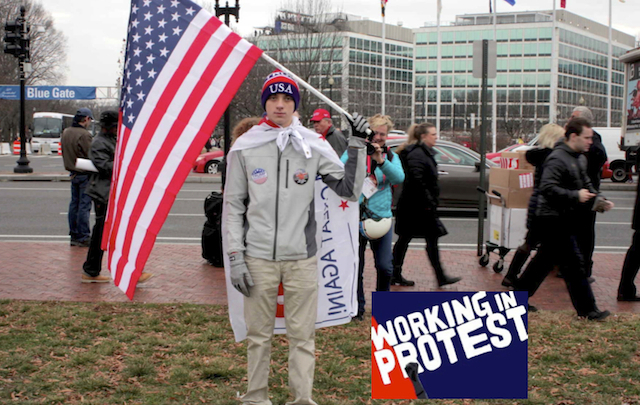 In the following Podtalk, co-directors Michael Galinsky and Suki Hawley break down their new film, “Working in protest,” and the meaning behind their overview of protesting over the years. For the full schedule of the last day (Sunday, June 10th, 2018) of the 25th Chicago Underground Film Festival, click here. The sponsoring organization of CUFF is IFP Chicago, a non-profit dedicated to the voice of independent film. For more information about IFP Chicago, click here.